Arsenal's Kim Little and Jennifer Beattie were on target as Scotland ended 34 years of hurt against the Auld Enemy at the Cyprus Cup. Little's 26th minute drive put Scotland ahead before Beattie's glancing header doubled their lead and secured the win. The win is only Scotland's second against England in 22 meetings ending a run of 17 successive English victories. "Some of our players need to take a good look at themselves," said England coach Hope Powell. England were not at full strength but Powell's team nevertheless had no excuses, said an angry national coach. "You have to give credit to Scotland," said Powell. "That performance answered a few questions. Not all the answers were negative, but the performance was not good enough." Disappointment for Powell was delight for the Scots. Little, born 13 years after that last Scotland victory over England in 1977, said: "This is a very special win for us. "We've come close to England before, but we've been closing in on all the big teams and we're going into matches like this believing we can get a result. "We were very organised defensively, got forward well, created chances and took them. It was a deserved victory - and a great day for Scotland." England started well enough and went close to taking the lead when a deflected Eni Aluko shot was stopped on the line by goalkeeper Shannon Lynn. But England keeper Siobhan Chamberlain then had to tip over the bar a well struck 20 yard drive by left winger Hayley Lauder. And in the 26th minute the Scots went ahead, Beattie cleverly back-heeling the ball through for Little to drive home an angled 12 yard shot. England forced their way back into contention and only a great Lynn save from midfielder Jill Scott's close range shot prevented an equaliser just before half-time. But Scotland regained control after the break and stretched their lead when Beattie met Lauder's 52nd minute cross with a glancing header into the far corner of the net. England worked hard in an effort to save the game, but they failed to create a single noteworthy goalscoring opportunity in the closing stages. The result put Scotland ahead of England on goal difference ahead of Monday's final group games, the Scots against Italy and England facing Canada. 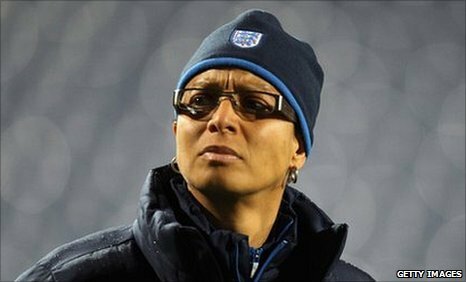 England (4-2-3-1): Chamberlain (Bristol Academy); A. Scott (Boston Breakers), Johnson (Everton), Stoney (Chelsea), Unitt (Everton); Williams (Everton), Bassett (Birmingham City); Clarke (Lincoln) (Susi (Birmingham City) 68), J. Scott (Everton), S. Smith (Lincoln); Aluko (New Jersey Sky Blue). Scotland (4-4-2): Lynn (Hibernian); Brown (Hibernian), Corsie (Glasgow City), Dieke (Boston Breakers), Fernon (Glasgow City); Love (Glasgow City) (Jones (Hibernian) 90), Ross (Glasgow City) (Murray (Hibernian) 70), Sneddon (Liverpool), Lauder (Spartans); Little (Arsenal), Beattie (Arsenal).